R. Schiedung, I. Steinbach, F. Varnik. 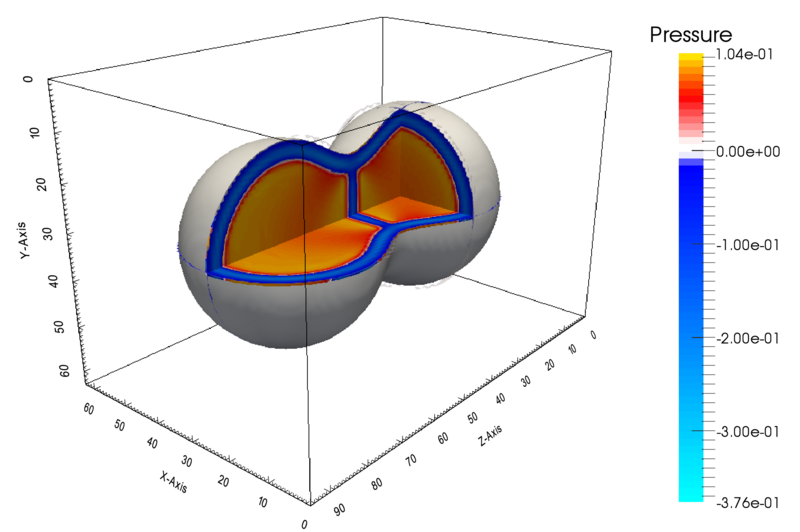 Color map of the pressure field p = 1/3 trace (σ) is shown alongside a cut into two spheres after having undergone a sintering process. The computation domain is discretized with 64 × 64 × 96 lattice nodes. The surface and interface energies are set to σ surface = 1J/m 2 and σ grain-boundary = 0.1J/m 2 . A method, based on the multi-phase-field framework, is proposed that adequately accounts for the effects of a coupling between surface free energy and elastic deformation in solids. The method is validated via a number of analytically solvable problems. In addition to stress states at mechanical equilibrium in complex geometries, the underlying multi-phase-field framework naturally allows us to account for the influence of surface energy induced stresses on phase transformation kinetics. This issue, which is of fundamental importance on the nanoscale, is demonstrated in the limit of fast diffusion for a solid sphere, which melts due to the well-known Gibbs-Thompson effect. This melting process is slowed down when coupled to surface energy induced elastic deformation.